In-house leasing, service, and support for the entirety of the agreement. You don’t need to own your equipment to leverage the best office productivity equipment available – you can lease it. And with the right partner, you can lease the exact technology you need for exactly how long you need it. Reliable budgeting; no need to use capital investment; and a wide-range of equipment choices and options are all great reasons to lease equipment. But the most important part of a lease agreement isn’t the agreement, it’s the partner you choose who will stand behind the agreement. You need a partner who will be accountable to you so that you can focus on work, not the equipment. That’s our commitment to you – your technology will work while we are responsible for it. No caveats. And we hold the lease in-house in our own Leasing Division so you get stellar Datamax service and support for the entirety of the agreement! Protect Against Obsolescence. Manufacturers constantly upgrade their products. Software and hardware improves every year. While equipment often remains a great fit throughout a contract, changing needs can have you trapped in a lease with out-dated technology that can’t do what you need to do TODAY! You need a leasing program that’s flexible enough to adapt to any changes in your business requirements. Minimal Startup Costs. Buying office equipment is a large capital expenditure for many businesses. A lease provides for smaller monthly payments and the ability to get the equipment you need in-house fast. Project-by-Project Requirements. Meet short-term or larger-than-expected needs quickly, without having to purchase additional equipment you would hardly ever use. We’ve been helping clients meet their short and long-term office equipment needs since 1975. We won’t surprise you with a low monthly rate followed by end-of-term inflated pricing. We also understand that your needs change, and you can continue to lease – at the same monthly rate (no hidden fees or charges) – even after your term has expired. When it comes to leasing, we have five advantages over the competition. Customer Responsiveness. We understand leasing as well as the business requirements (and the right technology) of leasing. We continually benchmark ourselves against a quadrant of four service metrics. Leasing Know-How. Our goal is to create life-long Raving Fans. We don’t do this by nickel-and-diming you. We walk you through your leasing options so that you can focus on what’s really important – your business. Technology Selection. With a hammer, every problem can look like a nail. We bring a complete toolbox to address your needs. Flexible Pricing. We don’t want you stretch your budget, we want to work within it. We can tailor your lease to fit your constraints. Spectrum of Lease Options. We don’t have a standard lease contract; we have agreements tailored to the needs of each client. 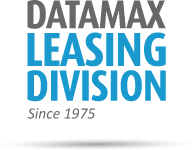 At Datamax, we will customize your lease to meet your exact needs, hold it for the duration of the term, and if a modification needs to be made, you come right back to us – not an outside group that doesn’t know you or your business. 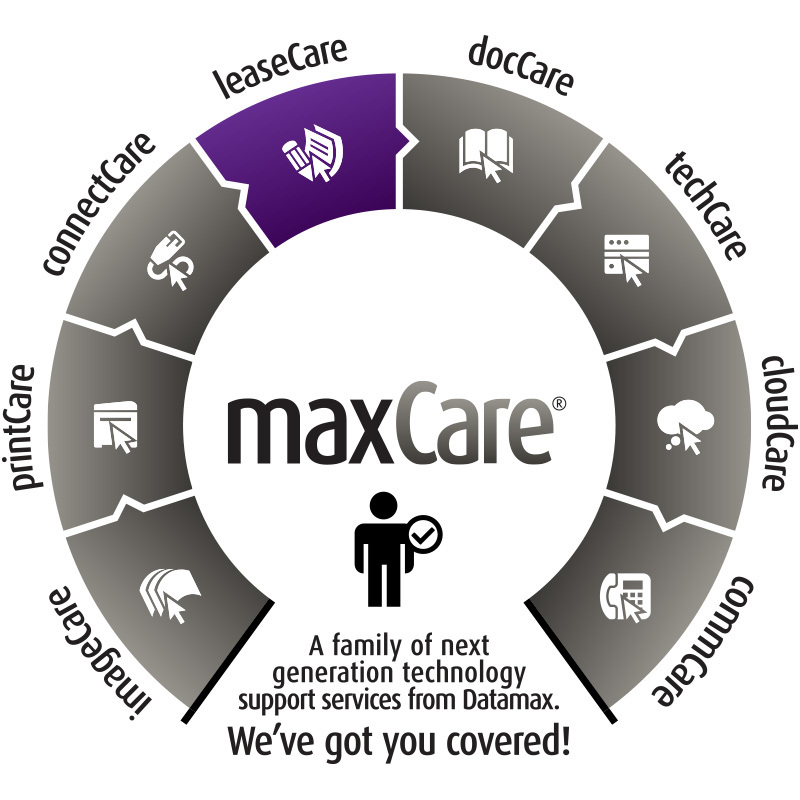 For more information regarding Datamax in-house leasing services and technology acquisition strategies, let’s talk. Lease with Ease. Get LeaseCare! “Our School has been in business with Datamax for many years, and I have always been very pleased with the services they have and continue to provide. About nine years ago, I was approached about switching over to Datamax for our copier leasing. I was concerned about switching companies but I was invited to tour the facility at Datamax and had copiers demonstrated for us. This was very helpful in my decision to switch to Datamax because it meant to me that our school's business needs were important to Datamax. Nine years later we now lease four copiers."